Just because you want a rugged truck doesn’t mean you have to go super large. 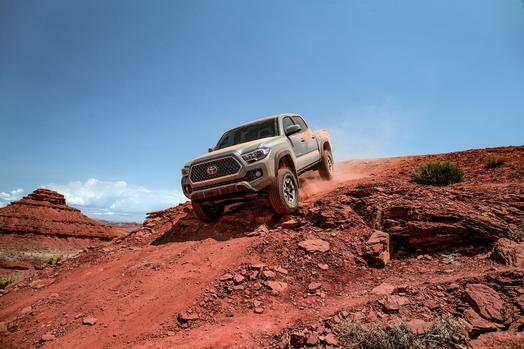 With the 2019 Toyota Tacoma pickup, what you get is a rugged setup that works great off the pavement but is still comfortable for cruising around town. In addition, this truck comes with all kinds of modern amenities and practical features you’ll appreciate for some time. Not only does Pedersen Toyota have a great selection of 2019 Toyota Tacoma models for you to check out, we also carry the rest of the Toyota lineup. View our inventory online by clicking the button below. The Toyota Tacoma pickup has become legendary for its thrilling and rugged performance. People also know it’s a truck which will take you wherever you’re going and get you back home safe. That kind of reliability and fun in a single package is more than compelling. It all starts with a 3.5-liter direct-injection engine. It runs efficiently so you’re not constantly stopping for gas but has plenty of power to tow and haul whatever you need. Perfectly complimenting high-strength steel in the chassis, which resists damage when traveling through rugged territory or handling an extra big load, like a couple of dirt bikes. For anyone with a serious addiction to adrenaline, the Toyota Tacoma TRD Pro is a perfect fit. Among the unique standard equipment is a special skid plate, a throwback front grille, and Rigid Industries LED fog lights. You can add even more goodies, such as a snorkel, perfectly complimenting your weekend fun. While there’s plenty of ruggedness about the Toyota Tacoma, the truck also packs plenty of modern and refined technologies. Some work to keep you safe, while others enhance your enjoyment of each ride. You’ll genuinely appreciate the Toyota Safety Sense suite. A range of proactive systems like pre-collision with pedestrian detection, lane departure alert with sway warning, and automatic high beams will help you to stay safe and secure, no matter where you venture. Since you spend so much time in your vehicle, it’s nice to enjoy some creature comforts. You get great ones with the Toyota Tacoma, proving you don’t need to suffer because you own a practical vehicle. For example, you can use the two USB 2.0 ports to plug in devices like a smartphone or tablet. It’s a great way to keep batteries topped off when you’re on the go. Speaking of keeping things charged up, you can add a Qi-compatible wireless charging pad, eliminating the need for any messy cords. Available dual zone climate control means you and your front passenger can choose your own settings. That means no more fighting over whether it should be warmer or cooler in the cabin. On the trail or in a parking lot, the standard backup camera makes reversing in the Toyota Tacoma a less anxiety-inducing activity. You can see what’s behind the truck better, whether it’s a large rock or another car, so you avoid an accident. Even better, add the optional rear parking sonar. 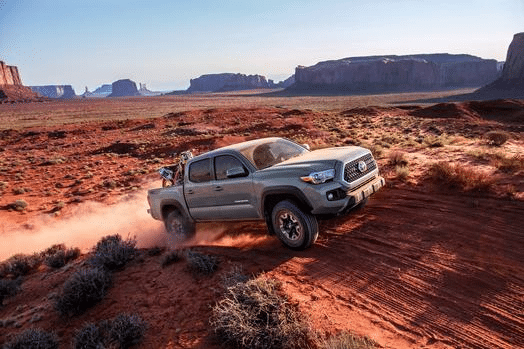 Experience these and many other features by scheduling a test drive of the 2019 Toyota Tacoma through Pedersen Toyota.